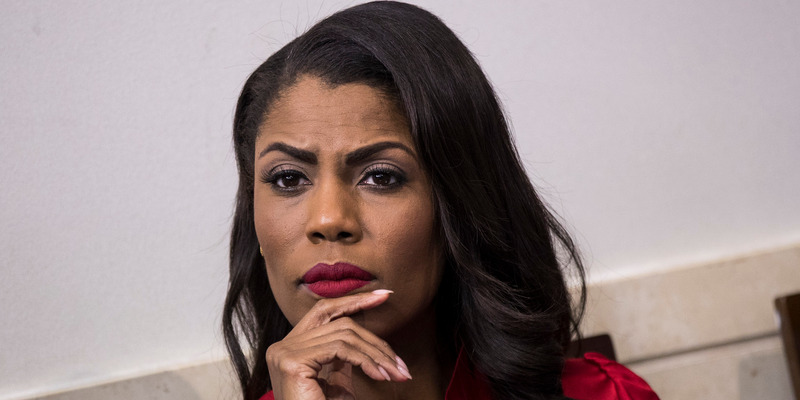 President Donald Trump’s campaign announced Tuesday that it’s suing former top White House aide Omarosa Manigault Newman. The news comes in response to Manigault Newman’s new tell-all book on the White House. She has also released a trio of secret recordings – including one of Trump – in recent days. President Donald Trump’s campaign announced on Tuesday that it’s suing former top White House aide Omarosa Manigault Newman for allegedly breaching a 2016 non-disclosure agreement by releasing secret recordings of top officials, including Trump, and writing a tell-all book on the campaign and administration she served. The Washington Examiner,The Washington Post, and the Associated Press reported that the campaign filed for arbitration against Manigault Newman with the American Arbitration Association in New York City for violating the agreement. The campaign told The Examiner that Manigault Newman, a controversial former contestant on NBC’s “The Apprentice,” broke the NDA by disparaging Trump in her new book, “Unhinged: An Insider’s Account of the Trump White House,” and by releasing secret recordings from the White House and campaign. Manigault Newman recorded chief of staff John Kelly from the White House Situation Room during her firing, in addition to recording her conversation with Trump that followed her firing. She has released both of those recordings, in addition to a third recording on Tuesday of a conversation with then-Trump campaign officials Jason Miller, Lynn Patton, and Katrina Pierson. The four discussed the possible existence of an audio recording of Trump saying the N-word. Manigault Newman claimed in her book that she heard of the existence of such a recording, though she said in recent interviews that she’s now heard the tape. Patton and Pierson, in addition to a number of Trump officials, have denied the existence of such a tape. The 2016 NDA Manigault Newman signed with the Trump campaign stipulated she she never “disparage” the Trump family “during the term of your service and at all times thereafter,” The Examiner reported. Manigault-Newman claimed she did not sign such an agreement for her White House work or as a prior condition to work for the 2020 campaign, a job that ultimately never came to be. But the 2016 agreement remains in force, the campaign told The Examiner. One official told The Examiner that the campaign is seeking millions in retaliation for her violation of the 2016 agreement. The campaign may also seek any “ill-gotten profits” from her tell-all book. Similar non-disclosure agreements are commonplace for the Trump campaign, the Trump Organisation, and the Trump White House, though they were almost unheard of in prior administrations,The Post reported.